It has been one year and one day, since the #SaveTheCloneWars website, Facebook page and twitter account were established on March 14, 2013. Thank you to the thousands of Star Wars: The Clone Wars fans who have supported the campaign. Over 6,000 of your have liked the Facebook page and over 1,500 of you have followed the twitter account. 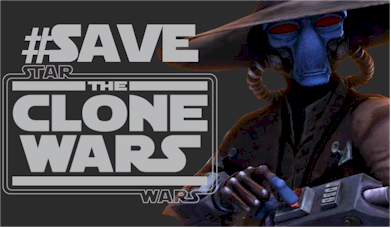 Thanks again to Jimmy Mac from Rebel Force Radio for sounding the alarm and being the first to encourage us to contact Disney and LucasFilm and ask them to #SaveTheCloneWars. Recently, some #SaveTheCloneWars supporters have suggested a new letter writing campaign. 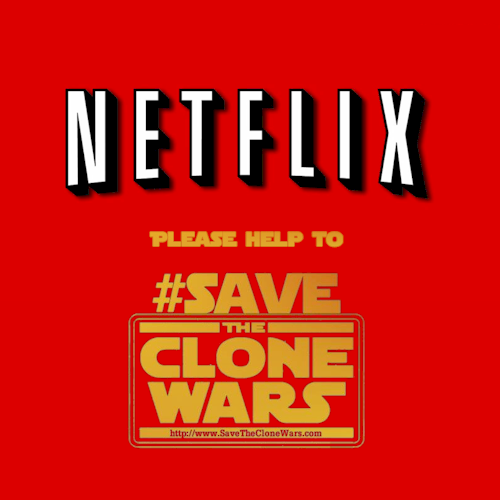 This time to write to @Netflix to thank them for being the home of "The Lost Missions," and to tell them that we would like more Star Wars: The Clone Wars. Netflix has recently been home to several original series and series revivals, and it has become a leader in home entertainment. Exactly what I want to know Josh! I don't understand why this is still going. Season 6 is going to wrap up the Clone Wars to the start of Revenge of the Sith movie. Therefore can be no more Clone Wars series, I'm a massive fan but I think Rebels will be as equally great! Have you seen the teaser trailer for star wars rebels? The trailer looks stupid and to be honest i think the Star Wars Rebels series will only insult star wars. Actually, DannyB10u, they had planned up to 8 seasons worth of material when it was cancelled. There were still a lot more stories to come, not just the stuff released as The Lost Missions. They had a lot of stuff in development. Season 6 does not take you up to the start of Revenge of the Sith. Fans know there was a lot more material in production then what we got. And some of us feel passionately about this show that we'd like TCW to finish where it was meant to finish, rather then cut off. Are you saying you do not want to see the Bounty Hunter arc, the Obi-Wan/Anakin arc, the Yoda/Wookie arc, the Quinlan Vos/Ventress arc, the Ahsoka and Bo-Katan arc? All these arcs and more were all in production. You can still have Rebels and The Clone Wars. If all that is true then my bad hlc1988, I heard through review sites that season 6 would lead onto revenge of the sith so I assumed this meant that they were to be the last episodes for this era. I would love to have seen more & more of this show but as this definitely won't happen now, I'm just looking forward to watching S6 when it's released on blu ray and then Rebels and of course the new film in 2015. The Clone Wars might come back, or at least get proper closure, if we never let Disney hear the end of it. Like Matt Lanter said,"you never know." Continue to send word to Disney to finish the Clone Wars properly with seasons 6-8 like they were going to do. You never know, they might just do it.